Columbus prides itself on being a city that is both smart and open. And when visitors step foot in the city, they feel it immediately. Home to one of the largest Pride parades in the Midwest that attracts more than 500,000 people and recipient of a perfect score by the Human Rights Campaign’s Municipal Equality Index (MEI), it’s clear it’s not just us that think Columbus is an open-minded and openhearted city. When you think of marquee LGBTQ events, this is one of the first that comes to mind, no matter what city you’re in. Columbus was lucky enough to host the NAGAAA Gay Softball World Series twice, and both years the event was held at Lou Berliner Sports Complex, the country’s largest softball and baseball complex. The 2015 tournament was the most attended in history, with 185 teams from 43 cities and over 2,500 athletes participating. Both years earned over $3 million in direct visitor spending. However, the Gay Softball World Series is more than just economic impact. In 2015, Columbus embraced the event and the event embraced Columbus from the Opening Ceremony at the Columbus Commons to the Closing Block Party in the Short North Arts District, it was truly an event that became part of the community. Returning to Columbus for the first time in 20 years, the NAGVA Championships will take over Columbus on Memorial Day Weekend. Over 90 teams and 1,000 athletes, coaches, volunteers, and fans from the United States, Canada and Puerto Rico will come together at the Greater Columbus Convention Center for the volleyball tournament, which will celebrate its 35th anniversary. There event will also benefit the Kaleidoscope Youth Center and the Buckeye Region Anti-Violence Organization (BRAVO) organizations. This annual event brings great tennis talent to Columbus. Part of the GLTA World Tour, which strives to include members of the LGBTQ community together with tennis for competitive, yet friendly tournaments, the Columbus Classic is held at the Wickertree Tennis Center in the first weekend of May. 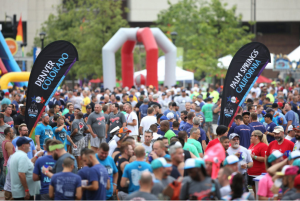 These are certainly not the only LGBTQ sporting events in Columbus! See one that is missing? Shoot us a comment with the information on the event.